Hosting is the service that stores your content and displays it to web viewers 24 hours per day, 365 days per year. You may choose from different web hosting plans to suite your individual needs, or you may choose a custom assortment of features. Typically, most web sites are relatively small and do not consume all the resources of an entire computer, your web site will reside on a computer with other sites, but will be completely isolated as if it were on a computer of its own. Those with very intesive bandwidth, size, or security concerns may opt to be the only site on an entire dedicated computer. The Basic web hosting plan is ideal for individuals or very small businesses. With this hosting plan, your web site resides on a big business server, just configured with less resources. Upgrading to a different hosting plan is as easy as a phone call. 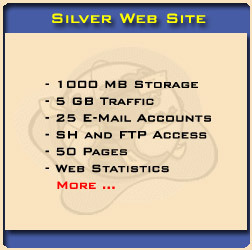 The Silver web hosting plan is perfect for small to large businesses. 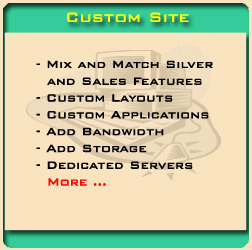 With this hosting plan, you can add storage and E-mail accounts for performance to rival any web site. Additionally, this plan comes with optional web statistics (AWStats). The Sales hosting plan and the Realty hosting plans are full featured offerings with more of everything. 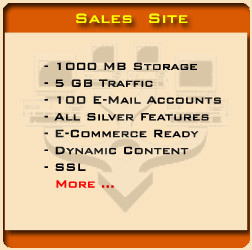 The Sales web hosting plan comes equipped with a full featured storefront and product managment back-end. Cusomize your server requirements by mixing, matching, and adding as required. You may configure your web hosting from sharing a server all the way to dedicated services (only your site on a machine) to having your site distributed over several geographically disperse servers.